GLASS ACT: Making sense of it all. 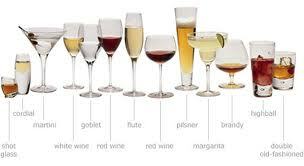 Yes, there is a method to the madness of all the different glasses for liquid libations. 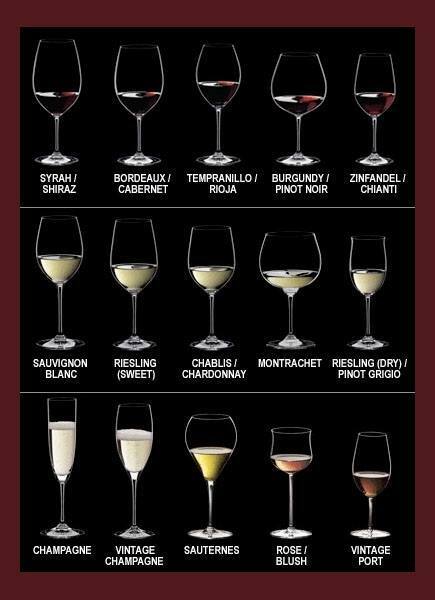 The type of glass differs even between red and white wine. A red wine glass has a clear, thin, stemmed glass with a round bowl tapering inward at the rim, while a white wine glass has a clear, thin, stemmed glass with an elongated oval bowl tapering inward at the rim. Do you ever wonder why we're supposed to drink wine from wine glasses, beer from beer glasses or brandy from brandy glasses? Well there's a reason and it's not as simple as you think. First, know this: It's not just meant to make you look fancy. These glasses are all specifically designed to maximize each drink's aroma and flavor in different ways. Even the pint glass you drink your beer out of is designed a certain way. And wine glasses, well, nowadays there's practically a glass for every variety, but you don't need more than a few to get by. If you have a chance to take a glass class from Riedal or other sophiscated glass company, I highly recommend it. You'll quickly get a clear understanding of how the right glass makes a significant difference.